High tea is an old English tradition that has grown into quite an extravagant affair. Attendees don their finest attire and meet in mid afternoon to sip hot tea from china cups. This hot beverage is generally accompanied by stacks of tiny sandwiches and numerous delightfully sweet treats to nibble on. Today it is quite a fancy affair but this was not always so. High tea was once simply a little more formal than the morning meal which was generally taken in the drawing room (or at the low table as it was referred to). Often buffet fare the afternoon tea usually consisted of an array of tiny sandwiches, sweet dessert treats, and china pots filled with hot tea. Oh how the Duchess of Bedford changed our view of this light meal. She brought a very royal sense of grandness to this dining experience. In the United Kingdom of yesteryear meals were served only twice daily so it became customary for a light afternoon tea to be served around four in the afternoon to tide people over from breakfast till the main meal served around seven pm. This daily break for refreshments was referred to as the afternoon tea and it was generally the serving of a light meal accompanied by a hot cup of tea. 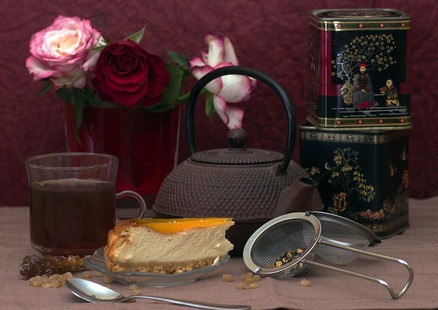 The first true high teas came into being around the early 1700's. It was Anna, the seventh Duchess of Bedford (1788 to 1861) who is believed to be the reason why high teas have become such a formal affair. The duchess found herself growing hungry long before the evening meal and began to have a meal served in her chamber around five rather than the traditional 7 p.m.
At first she dined alone but she soon initiated a tradition of inviting a few of her closest friends to join her at the main table (high table as it was then called) for afternoon tea. Being invited to the tea was quite an honor and so it was that the first High Teas and the traditions surrounding them were born. The Duchess was quite a trend setter and her afternoon social quickly rose in popularity with others happily hosting their own events. Today High Tea has come to be understood as a formal affair to be served around four in the afternoon. Restaurants and finer homes would serve very luxurious high teas while even lowly homes serve theirs with as much grandeur as they were able to accommodate for the occasion. In the present day we now view the concept of High Tea as meaning a delightful meeting of friends and acquaintances hosted with the serving of a variety of hot beverages, sandwiches, and sweet dessert treats. Today these afternoon respites are a very elegant affair served with much pomp and grace. Participants are encouraged to wear formal dress and the tea itself is served using the finest dishes available for the occasion. The term itself has come to represent an affair that is generally conducted with much dignity and extravagance. Small sandwiches and sweet delicacies are still the norm to be served. Fine hotels such as The Empress Hotel in Victoria, B.C. as well as a number of other fine resorts still host this afternoon extravaganza with all the grandeur that one would have expected to accompany the Duchess of Bedford's formal invite in days of yore. From where I sit in the drawing room I can hear the soft clinking of china cups. Melissa is preparing high tea and I can hear her humming softly to herself as she adorns the table with her finest pieces. Only the best will do for this most special of occasions. I hear the rustle of tissue paper as she unwraps her special centerpiece. I smile imagining her at her work. She will set one tiny little gold teaspoon, knife, and fork beside each small flowery china cup and saucer. There will be slightly larger matching plates for us to partake of the food fare. She will have only the sweetest cuts of ham and the spiciest beef for our tea. These tempting meats will be placed atop hot scones rich with the savor of dripping butter. I can almost see her as she brings out the plates of delicacies that she has baked the night before. At this moment she will be wearing her favorite linen apron. It is covered in roses which are her favorite flower and it matches the floral dishes that she has set out for our tea. The cream she pours for us will be rich and freshly milked from our old cow Bessie just this very morning. There will also be strawberries, raspberries and grapes to go along with any number of Melissa's other freshly baked treats. I can almost taste her gingersnaps soaked in the wetness of sweet sugared tea. I can now hear her talking to her guests as they arrive and I know that she will summon me when she is ready for my appearance at the table. I am the family head, the matriarch and I will have my place at one end of the table, this being at the direct opposite end from my Melissa. The first high teas were not nearly so elegant as the feast that Melissa has prepared for us on this day. The first teas were actually quite simple affairs that originated in the United Kingdom around the early 1700's. Back then it was referred to as the afternoon tea. Hosted around 4 in the afternoon they were usually a simple light meal that was accompanied by tea. As meals occurred only twice daily in the United Kingdom this small bite to eat was intended to tide people over from breakfast till the main meal which would have been served around 7 o’clock. 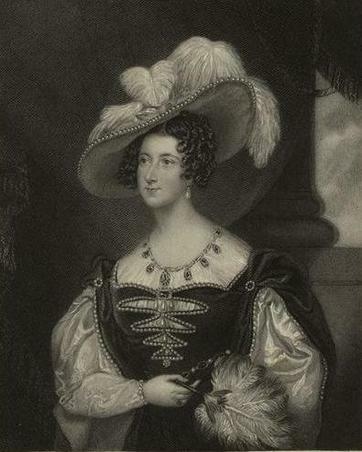 It was Anna, the seventh Duchess of Bedford (1788 to 1861) who is responsible for our more fashionable version of High Tea. Being quite impatient and finding herself growing hungry long before the evening meal the Duchess began to dine around five rather than waiting for the traditional 7 o'clock meal. At first she dined alone but she soon initiated a tradition of inviting a few of her closest friends to join her at the main table or high table as it was then called. It was quite an honor and the invited guests arrived in their finest dress as would have been suiting such an occasion. This then became the makings of the first high teas and the tradition rose very quickly in popularity. The term "High Tea" has since that time come to be understood as "Formal Tea" and since the Duchess's initiation into this occasion it has traditionally continued to be quite an elegant affair. Such as that which my Melissa now has almost fully prepared for our guests. The door softly opens and there stands Melissa, she has removed her apron and now looks radiant in a beautiful spring dress of varying shades of pastels, her hair is piled high atop her head. She smiles and whispers for me to follow her into tea. I set down my book, after such a long wait I am only too willing to obediently comply. As always the table is perfect. Red roses pose in splendor from a crystal vase set at the center of our meal. They match the flowers that adorn the delicate china cups and plates that are Melissa's greatest pride. The teapot, creamer and sugar bowl gleam brilliantly gold and blend in ideally with the gold color of her finest spoons, knives, and forks. Folded floral napkins sit beside each small plate and the food, oh the food, there are just no words to describe this feast. I smile at her and she smiles back at me. I nod acknowledgments to each of our guests before I seat myself to eat. Rachelle, who Santa gave to Melissa at Christmas this past year, sits in regal dignity to my right. Melissa's old brown teddy sits to my left she has had him since she was three. He has lost some of his fur and carries across his chest a nasty scar received in a battle with our cat Max. Barbie sits on the table beside Melissa because of course, she is just too short to otherwise see the goings on at this fine tea. Melissa whispers softly, "Shall I pour the tea?" and I respond with a dignified, "Please". The act of conducting 'High Tea' is proving itself to indeed be a timeless tradition. The simple act of stopping to enjoy an afternoon beverage with friends is once again quickly becoming a fashionable pastime and many restaurants are happily participating in this event. Although some fine hotels still conduct daily excursions into this delightful pastime you can also decide to host your own High Tea as well. Simply dust off your finest china invite a few friends over for an afternoon meeting and spend a little time enjoying this simple ritual of yesteryear. New research confirms that drinking tea can indeed be a healthy treat to partake of. It is much more than just a relaxing beverage and if you opt for a cup of the green or white variety then you will find yourself sipping a beverage ultra rich in antioxidants. It is one of the reasons why an old fashioned tradition is coming back into vogue. Although most tea are healthy beverages the green and white varieties are especially good for you. The method by which they are processed leaves these varieties rich in catechins and they are what makes the white and green tea so unique. Catechins? What the Heck is That? Catechins are powerful antioxidants and research now suggests that they may also be associated with an ability to loss weight. More significantly to a very specific type of weight loss, that being the reduction of belly fat which is that oh so very difficult weight to lose. Catechins enhance fat oxidation and increase your metabolism thereby allowing you a quickened natural weight loss. It is suggested that 300 to 400 mg of green tea per day, or the amount you would consume in approximately 5 cups of green tea, would be a sufficient amount of catechins to help in the loss of belly fat. Also note that caffeinated tea allows the absorption of these to occur much easier than if you were to consume a decaffeinated beverage.